The Q-ConPot® (Control System Honeypot) network appliance is an ICS and SCADA honeypot. Network honeypots provide network obfuscation (hiding in plain sight) and denies the hacker easy network reconnaissance, while greatly increasing the chance to detect a network breach. The Q-ConPot uses ConPot, an open source software package that has a wide range of built-in industrial protocols so that administrators can create attack surfaces that mimic their actual environment, or portray a very complex and fictional infrastructure. This enables administrators to create network obfuscation and deception, thereby denying hackers an accurate map of the network and its machines, as well as increasing the likelihood of the network breach being caught by an Intrusion Detection System (IDS) such as the Q-Box® or by the Q-ConPot itself. In order to increase the deception capabilities of ConPot, the administrator can create in the Q-ConPot custom Human-Machine Interfaces (HMIs), thereby increasing the number and type of attack surfaces. The response time of the attack surfaces can also be tweaked for various delay times so as to mimic the behavior of an industrial system under constant load. ConPot can be accessed using production Human-Machine Interfaces (HMIs) or via web interface. Also included is ntopng, the latest iteration of ntopng providing high speed, realtime Web-based analysis and traffic flow collection and monitors all network usage. It includes an alert function for anomalous traffic, and HoneyBadger, which gives administrators using the Q-ConPot, unlike other honeypot systems, the ability to fight back by identifying the attacker’s location via geolocating the attacker’s IP address(es), as well as prevent TCP injection attacks, including 0-day (Zero Day) attacks. ConPot is an open source, host-based, honeypot system designed to provide network obfuscation and deception on ICS and SCADA machine networks. ConPot allows the administrator to create attack surfaces that mirror the actual production environment, as well as additional attack surfaces to as to create a maze of faux equipment (“attack surfaces”) that the hacker must navigate. This takes time and greatly increase the risk of the hacker being discovered before industrial equipment is compromised. Xplico is for open source package for real time network packet capture and forensic analysis. In the event Snort shows suspicious activity, network administrators can capture and examine in depth real-time traffic for deeper analysis of suspicious network traffic. In addition to packet inspection, Xplico allows for reconstruction of the actual traffic. E.G. E-mails, texts, IM’s, pictures, etc. ntopng is the the latest iteration of ntop. ntopng provides high speed, real time, Web-based traffic analysis and traffic flow collection, and monitors all network usage, It includes an alert function for anomalous traffic. HoneyBadger is an open source, comprehensive TCP stream analysis tool for detecting and recording TCP attacks. HoneyBadger combines a variety of TCP stream injection attacks to help insure that the TCP attack identification is reliable, and not a false positive. HoneyBadger includes geolocation to pinpoint the attacker(s) physical location. Webmin Is is used for network appliance housekeeping and network configuration. Webmin also allows for the linkage of multiple Q-ConPot appliances for simplified administration. HA Proxy is the leading open source package for automatic failover and load balancing. Up to 32 Q-ConPot network appliances may be linked for automatic failover or load balancing for coverage of extremely large networks. Administration is done through a web gui. The number of deployed attack surfaces is limited only the number of available LAN IP addresses. 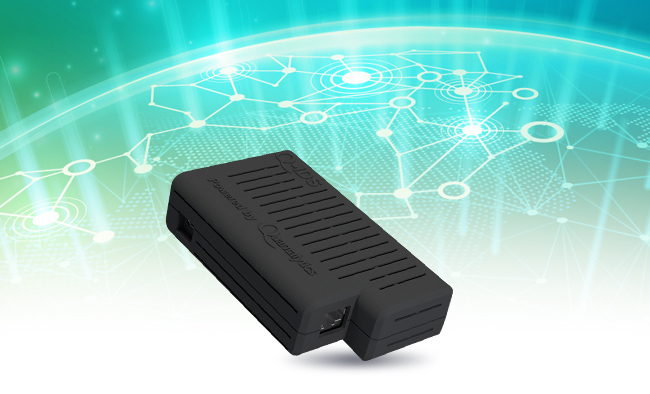 The Q-ConPot network appliance has both a 1000 mbps (gigabit) NIC and 802.11 b/g/n WiFi. The Q-ConPot network appliance is also available as a Virtual Machine (VM). The Q-ConPot network appliance is completely administered through a Web GUI. All package usage is via Web interfaces, thereby opening up sophisticated intrusion detection, network forensic analysis, and network monitoring to even novice network administrators. No Command Line Interface (CLI) or Linux skill is required. Notifications are provided by e-mail using SendMail, which is configured with a module in Webmin, and syslog entries. The Q-ConPot network appliance can be integrated with Nagios® in the Q-Box as another notification route. SMS notification is available as an option. The Q-ConPot network appliance can also be integrated with the Q-Log® network appliance or any other Syslog or SIEM solution. Q-ConPot® and all registered trademarks above are property of their respective owner(s).